While visiting friends and family on Cape Cod this weekend, we had the chance to sample oysters and clams being served at The Quarterdeck Restaurant in Falmouth, MA. The menu offered local oysters from Chatham and Pemaquid and clams from Waquoit Bay, so naturally we tried them all. They were shucked to order, fresh, tasty and well presented. 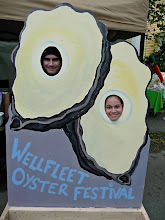 I highly recommend oysters from the Quarterdeck in Falmouth, MA a nd I look forward to returning! I hear they often serve oysters from different locales. The rest of the menu looked great as well, but it is always hard for me to get past the appetizers. Go, and enjoy. And say hi to the Falmouth Track Club members who frequent the bar on Friday nights, after their weekly 5 mile race, The Coffee-O Five.